Long hours in front of the computer, crappy office chair, annoying back and neck pain. Sounds familiar? You Googled “Best Office Chair”, found Herman Miller and its price overwhelmed you. Here we are for the rescue! 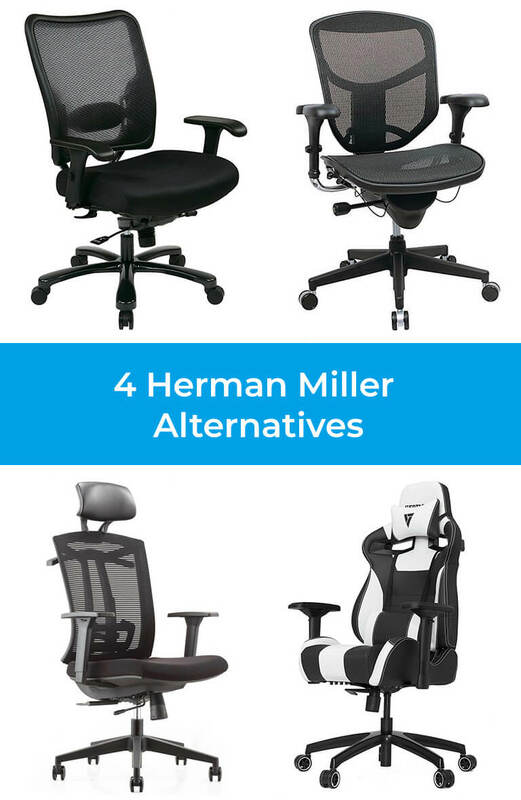 In this article you will find best Herman Miller alternatives for people who suffer neck / back pain and need something with ergonomic and stylish design. Many people, just like you, wonder what is so special about these pricey chairs and if there are any good Herman Miller alternatives – that would offer similar features but at much lower price. 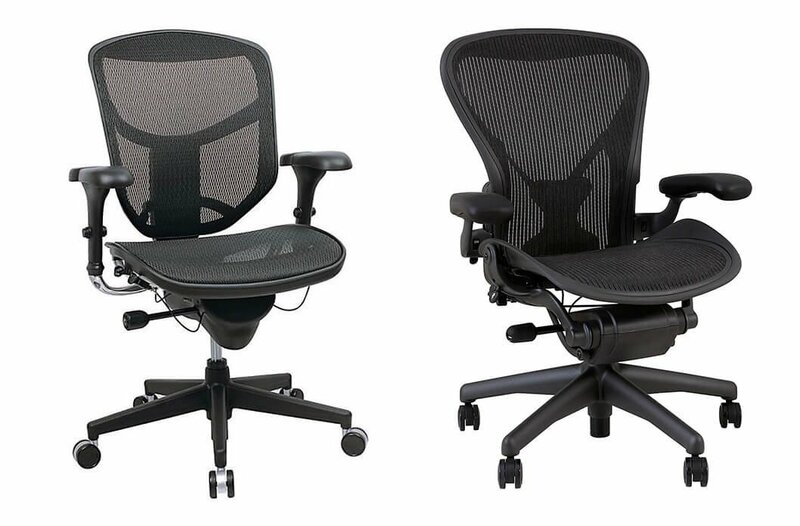 I found at least 4 ergonomic office chairs – each under $350! – that are perfect Herman Miller alternatives. These models have modern design that looks good in any workspace and thanks to multiple adjustments they support user’s body really well. Their quality is a top-notch as well. Some customers even say these chairs work better than Herman Miller chairs! If you’re looking for the best Herman Miller alternative, you’re in a good place. Here’s my ranking that will help you to choose an affordable ergonomic office chair with quality and functions of high-end products. 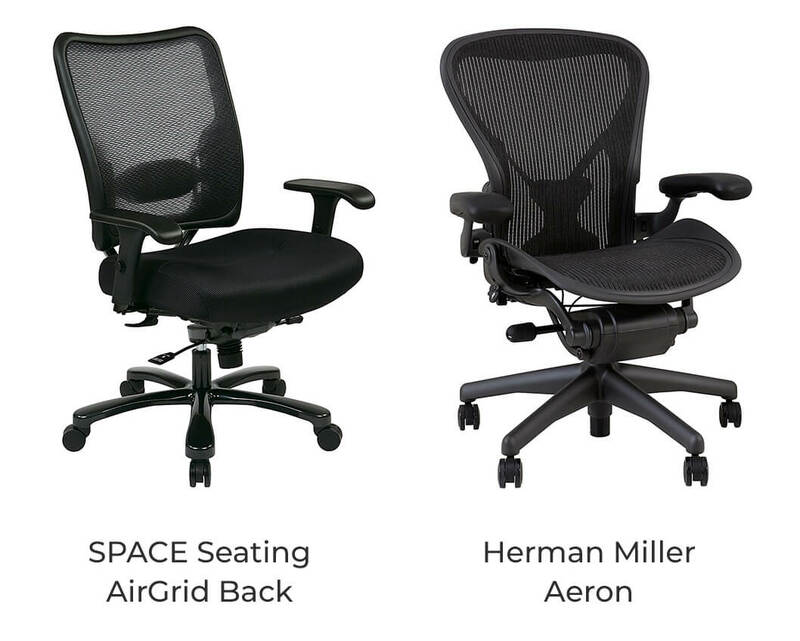 According to many customers, Aeron Chair by Herman Miller is very comfortable and helps with back and hip pain. Users love the multiple adjustments (in most advanced and expensive version armrests go up and down, forward and backward and pivot left to right, lumbar support can be positioned up and down, the backrest recline and you can adjust its angle and tilt tension). Breathable fabric is perfect for summer days and users with tendency to sweat. Herman Miller Aeron has however one big disadvantage – the new model usually costs about $900-$1200. I decided to find an ergonomic office chair similar to Herman Miller, built with high-quality materials and price under $300. The SPACE Seating Ergonomic Managers Chair perfectly meets all these terms. This computer chair has mesh backrest that provides good air-flow and keeps the user back dry. It is comfy and supportive at the same time. Many users love this airy back and the amount of support it gives. There is also lumbar support that can be moved up and down, similar to Herman Miller Aeron, so it adapts to user lower back natural curve. Such an ergonomic shape is perfect for lower back pain and long hours of sitting at the desk. Many customers confirm this chair is helpful for back problems and hip pain. The backrest reclines to many positions and you can also adjust the tilt tension. This SPACE Seating Chair armrests go up and down. They don’t pivot like Aeron armrests, however they are width-adjustable and slide inwards and outwards. This ergonomic office chair looks great and has simple, modern design. 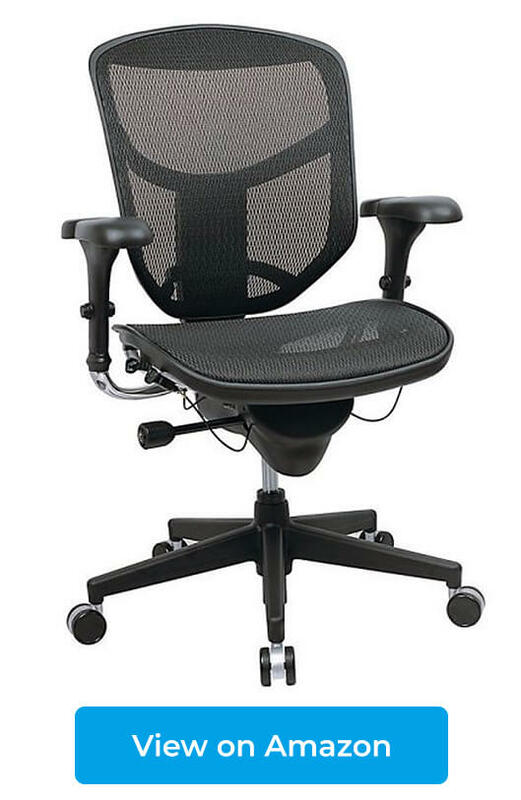 And although it has many similar features to Aeron functions, it is about 3 times cheaper! It is awesome cheap Herman Miller alternative. There is however one big difference between these two chairs that you need to keep in mind. Herman Miller Aeron Chair comes in 3 different sizes – for small, average and large people. On the other hand, SPACE Seating Ergonomic Managers Chair has only one size that is most comfortable for average in height and tall people (above 5’10″). If you’re short and petite person, it won’t be the best Herman Miller alternative for you. This chair looks extremely similar to Herman Miller Aeron Chair and has many similar features. You won’t believe that it is also FEW times cheaper! If you’re looking for a cheap Herman Miller knock-off you should definitely consider this model. The backrest is covered with mesh fabric to provide good air circulation – according to customers it’s firm, soft and breathable at the same time. The armrests have adjustable height and angle, just like the Aeron Chair. Moreover, there is unique gel padding on the armrests which helps to reduce shoulder strain. 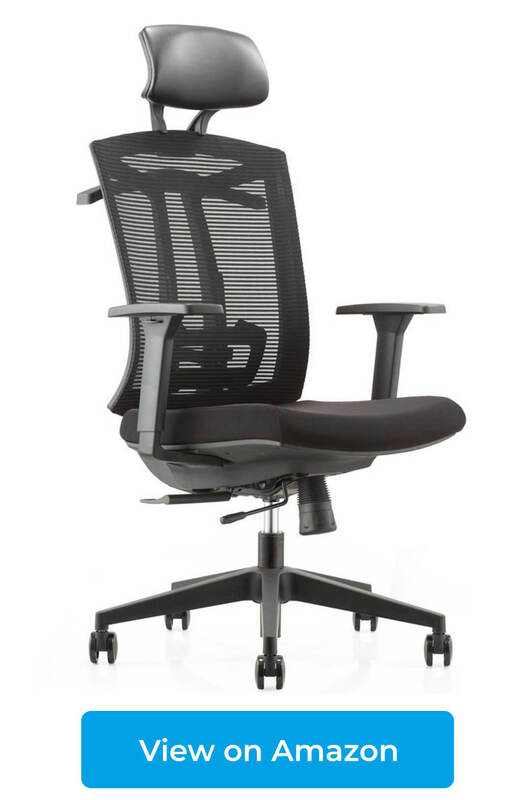 Although the backrest is ergonomic and S-shaped, the lumbar support is not adjustable, in contrast to Aeron. However this chair has one additional feature that Herman Miller Aeron doesn’t have. The seat cushion is depth-adjustable. It glides forward and backwards to adapt to user body type and his legs length. Thanks to this feature, this chair support user pelvis and sacral area. Moreover the seat has waterfall design to decrease pressure on thighs and help to improve the blood circulation. You can also adjust the tilt angle to find the best position during long hours of working at the desk. What is the most noticeable is this chair design – it looks incredibly similar to Herman Miller Aeron. Many customers have noticed this similarity and say that when you consider 3 times lower price, this chair is actually comparable to Aeron! This Herman Miller knock-off is perfect choice for people who have a budget of $300 and want to have a chair with Aeron design and decent quality. What distinguishes Herman Miler Sayl Chair is the modern, innovative design and it’s difficult to find a chair that could compete with this chic and stylish look. However, it’s not that hard to find an ergonomic chair with similar adjustments and functions at much lower price. Sayl is most comfortable for short and petite users and according to them, it helps with lower back pain. Its sleek back is comfy, supportive and breathable. As a cheaper alternative for Herman Miller Sayl I can recommend you Vertagear S-Line SL4000 Racing Series Gaming Chair (Rev. 2). 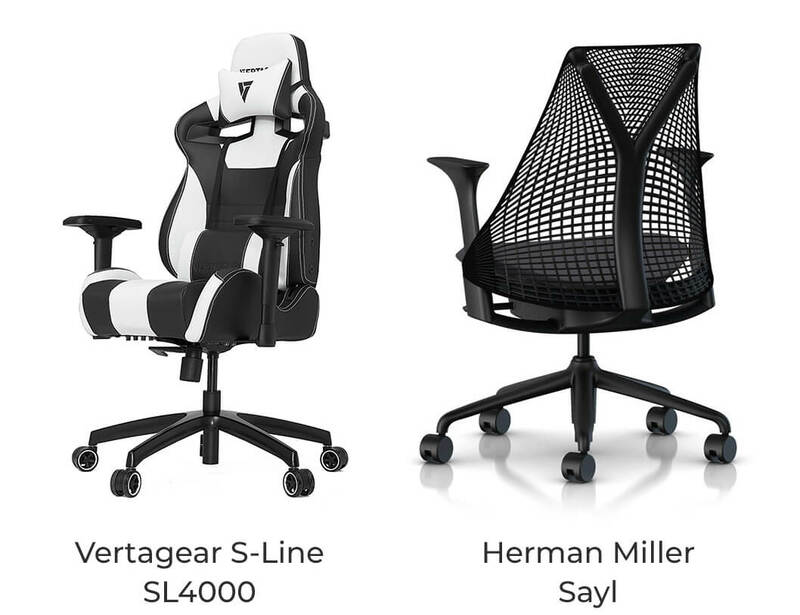 According to many customers Vertagear is a Herman Miller of gaming chairs. What distinguishes Vertagear chairs is the quality, modern look and multiple adjustments that make this chair adapt to user, not the other way round. Vertagear S-Line SL4000 is designed for small people (up to 5’8″) just like the Herman Miller Sayl. It comes with a neck and lumbar support cushions. You can move these pillows up and down to adjust their positions to your spine natural curves. The amount of lumbar support is great and helps to relieve the lower back pain. SL4000 has 4D adjustable armrests – similar to Sayl – that help to reduce the wrist and shoulder fatigue, as well as reduce the risk of arm injuries. Check how looks Herman Miller when we compare it to Steelcase. Click here and learn about Steelcase Leap vs Herman Miller Aeron differences. Vertagear chair has one feature that may be the reason why people may prefer it over Herman Miller Sayl. It has long backrest and neck pillow so it supports not only the lumbar area, but also the upper back and reduces shoulder and neck tension. Sayl has shorter back therefore it’s not a good option for people who have shoulder and neck pain. Moreover, Vertagear SL4000 features deeper recline – up to 140 degrees. However it doesn’t have forward tilt or adjustable seat depth like Sayl Chair. 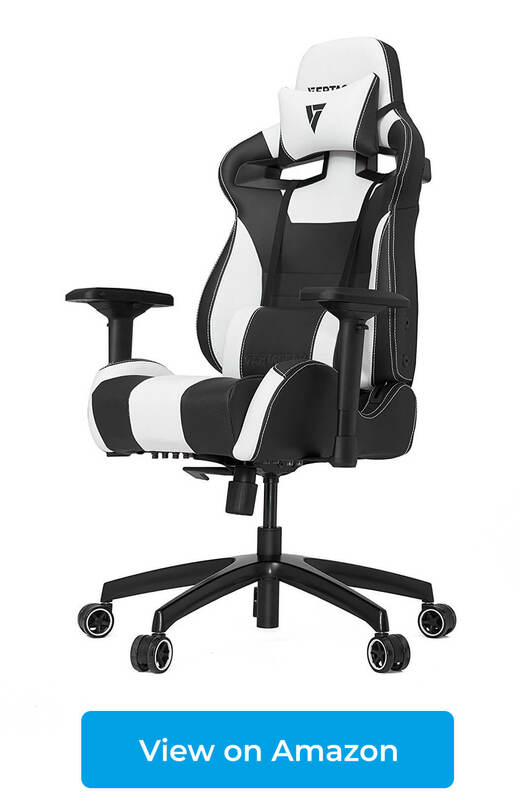 According to customers this chair from Vertagear is comfortable and the padding has proper depth to provide support without making the user sweat. Herman Miller Sayl has not only ultra-innovative design, but it also offers many color versions. Vertagear SL4000 offers not a bad color options as well. It comes in 9 different versions which have modern racing car seat design which may look awesome in home or business office. If you’re looking for a chair like Herman Miller but cheaper, Vertagear SL4000 is definitely worth checking. Embody Chair by Herman Miller is one of the most expensive ergonomic office chairs, no wonder many people look for cheaper alternatives. People love Embody for its multiple adjustments (like the seat depth, armrests height and width and backrest shape) and high-quality breathable fabric. Many users praise this chair for helping with sore back and circulation in legs. CMO Ergonomic Mesh High-Back Ultra Computer Office Chair is a good example of cheap Herman Miller Embody alternative. 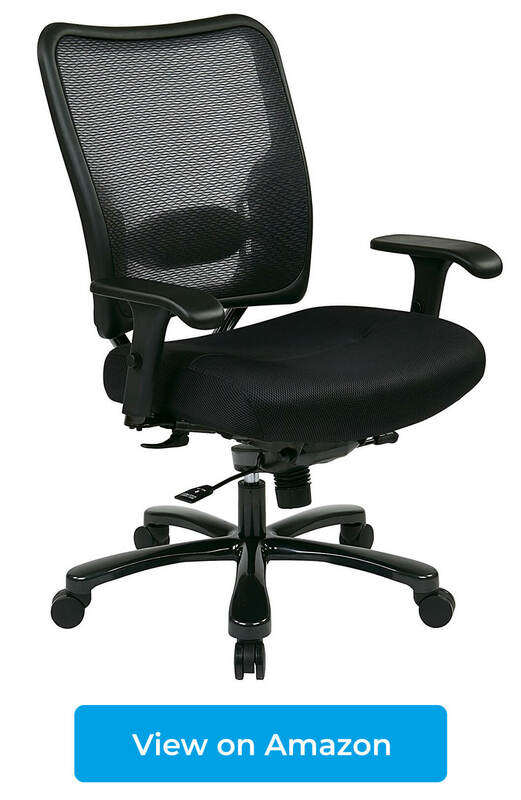 This inexpensive ergonomic office chair has skeletal back frame with mesh cover that provides proper ventilation. There is adjustable lumbar support that user can move higher or lower, depending on his body type and natural curves of the lumbar spine. S-shaped backrest reclines and locks into four positions giving you maximum comfort and support during working and relaxing. It also features headrest for exceptional shoulder and neck support (there is also few dollars cheaper version without the headrest). Moreover, the headrest has adjustable height, angle and pivot! Embody Chair by Herman Miller lacks this feature and many customers complain about it. You can adjust the armrests height and seat depth (by sliding the cushion forward or backward) to reduce the pressure on thighs and wrist pain. On the back of the seat there is a useful hanger for your jacket or bag. Nice addition. However Embody Chair by Herman Miller has one unique feature that you won’t find on any cheaper alternative: you can adjust the backrest to your spine natural curves by making it more flat or curved. Customers love that feature as it help to reduce painful pressure on back and maintain proper posture. If this feature is important for you, go for the Herman Miller Embody as there is no cheaper and good-quality chair with such an adjustable backrest. If you’d prefer to spend less money on a chair and an adjustable lumbar support will be enough for you – go for the CMO Ergonomic Mesh High-Back Ultra Computer Office Chair. It is a great cheap Herman Miller alternative with awesome lumbar, neck and shoulder support, designed for short and average in height people. 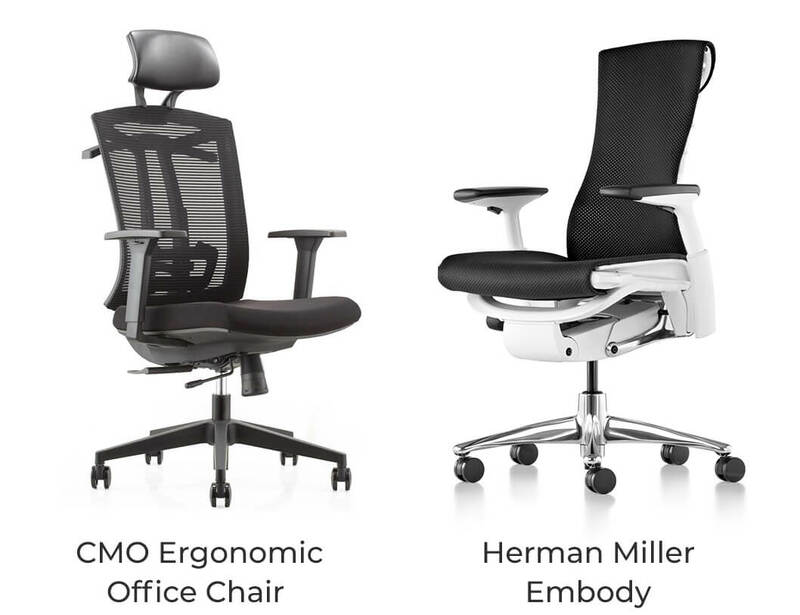 As you can see, although Herman Miller chairs have awesome features, huge adjustability and stylish look, there are cheaper alternative that may offer you the same (or very similar) functions and quality! You do want a good-quality chair that won’t cost you an arm and a leg choose one of the chairs similar to Herman Miller that I recommended above. They are inexpensive, but have a lot to offer too!